Ruptly short-listed for media innovator award. Moscow, December 2017: Global multimedia news agency Ruptly has been shortlisted for the prestigious Global Media Innovator award for its groundbreaking platform Ruptly Live. The award recognizes projects that have the “greatest impact on the development of the global digital community,” and is presented by the Diplomatic Council, a global think tank accredited by the United Nations. Ruptly Live allows anyone and everyone to stream the agency’s live broadcasts in 4K format cheaply and easily – from viral videos and breaking news to innovative 360 videos and drone footage. All users need to do is simply log in, select an event and start broadcasting the stream to their personal blog, website or social networks. The service can stream up to eight broadcasts simultaneously across multiple platforms; meanwhile live translations are available in four languages. The project was unveiled at MIPCOM in October 2017. The Global Media Innovator award ceremony will be held on February 2, 2018, at a gala in Frankfurt, Germany, after the winner is selected by a top-class board of media and IT experts from all over the world. Ruptly is an award-winning global multimedia news agency that provides real-time and archive visual news content to more than 850 media companies, including major TV channels to online platforms from over 70 countries. 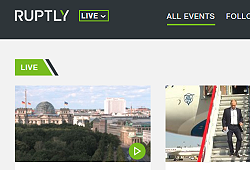 Ruptly’s content has appeared on air and online for networks such as CNN, NBC, CBS, Mail Online and VICE, among other major international media.